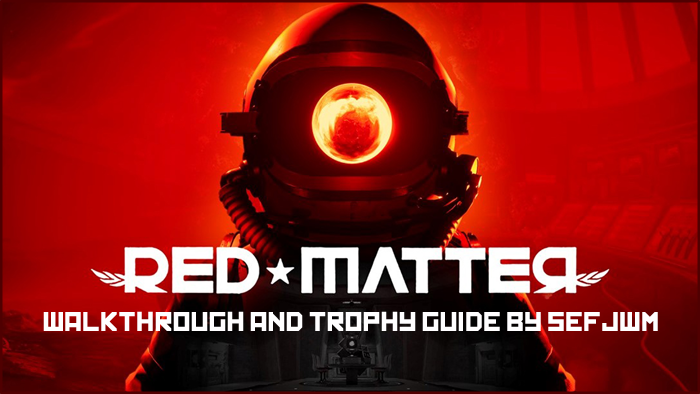 Red Matter is a exploration and puzzle game where you are sent to an abandoned science facility on Saturn's moon, Rhea. You are Agent Epsilon of the totally not the United States, Atlantic Union. You have been sent to this base to retrieve a top secret file from the totally not Russian, Volgravians. Something bad has happened here and you need to get in and get out with the files. Movement in Red Matter is done in two ways. The right controller controls both methods with and controlling the teleport (in this game it's more jetpack than teleport) and for walking forward. and let you rotate when you are on the ground. Both controllers have a claw tool for the normal grabbing and pulling motions and the left controller adds in a swappable scanner and flashlight. Almost every trophy is story related and unmissable. I would recommend just playing the game and enjoying it. It's a short game so a second run for cleanup isn't bad. If you don't want to play twice then be on the lookout for large red king chess piece paintings on the walls. There are only 3 and they are pretty easy to find. One is in the warehouse, one is in the hall on the way to the power room, and the last is in Sasha's room. Once you get to the habitat area, make sure to play the video found in Stras' room (you have to take it back to Nikolai's room to play it). It's very hard to miss. The last missable trophy is for a data disc that shows pictures of the devs. It's to the left once you exit the facility. See the trophies for more information. Story related and can't be missed. There are multiple data drives in the game that have to be scanned before you can proceed with the story. This is the first and it's behind you in the crashed landing module right at the beginning of the game. This drive is on some crates in the middle of the warehouse. There is a lot of chess iconography in the game but only 3 large paintings of red kings are needed for trophies. The first one is in the warehouse. Up and behind the lift is a storage area with a bunch of crates. This red king in on the center pillar/wall. Once you scan Stas' security card, use it on the elevator to enter the security and maintenance floor. This drive is located on the desk by some monitors. It's the desk with the wall showing the power status of the entire room. Once you enter the security and maintenance area the power will go out. It's on the right wall on your way to the power generator room. Once you get into the generator room you need to solve the 4 power stations to restore power. After you access the security room you need to solve the hacking puzzles to get access to the vault. Inside the vault is a locker. The drive is in the top right. This drive is in Nikolai's room to the left of his bed. In Nikolai's room there is a panel on the wall with shapes that match the statue in the main habitat area. 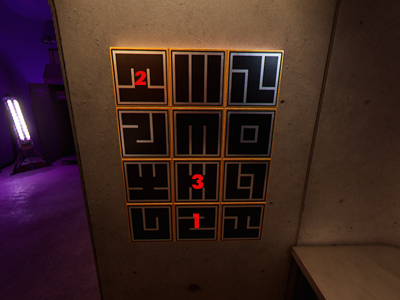 Use the model of the statue on his desk to figure out the three symbols needed to unlock the secret room. In Stas' room there is a tape floating in front of the red portal. Take it back to Nikolai's room and play it on the TV in front of his bed. In Sasha's room there is a desk with a bunch of post-it notes with drawings of pawns on them. The red king is behind the notes. If you have trouble scanning it you can remove the pawn drawings. Use Sasha's credentials to open the door to the Quantum Lab. Once you solve the laser puzzles in the Quantum Lab, you can get in the teleporter and move to the sealed off back room. The documents are sitting on a table in the center by the glass. Scan the Quantum Physics Datadrive. In the Quantum Lab there is a locker to the left of a poster which explains the teleporter process. This drive is in the middle right shelf. This drive is on Olga's main desk in the Communication room. After aligning the relays and the communications dish, you use the terminal to upload the documents. After you attempt to send the documents you are met by the cosmonaut and led outside the facility. Once you exit the facility you will have the cosmonaut in front of you pointing at the communications dish. Turn left and go around the door into a darkened area with a bunch of crates lying about. The drive is on top of the crates near the wall. This walkthrough is going to skip optional areas and scans. You will miss a lot of the story following it. It's really not needed unless you get stuck. Move down the path until you are in front of the warehouse. Hit the button to open the warehouse and enter. Hit the button again to close the door. Now use the jetpack to fly up to the elevated lift in the center of the room. Move this lift to take the fuse from the box above the door. Place the fuse in the box near the airlock. Now grab the fuse from the box near the button for the main door. Place this in the airlock fuse box as well. With the new fuses in place throw the switch in the box that opens and then open the airlock door. Inside the airlock hit the button to close the door and then turn the two knobs on the wall to open another breaker switch. Throw the switch to direct power to the central device. Turn the knob on the device to activate the top handle. Pull of the top and then the 4 metal braces around the device. With the braces off turn the center crank until the walls rotate enough to open a new door into the dressing room. Just past these desks is a set of knobs and breaker switches (middle left side as you face into the room). Turn the knobs and throw the switches to turn on some backup power. Head back to the desk and scan the paper to the left of the drive. This gives you a restoration sequence. Directly behind you is a bank of buttons which need to be pressed according to this sequence. This changes from game to game so each time will be different. Once those are lit up the crank should activate and flash red. Turn it until the green light comes on to restart the subsystems and get the lights back on for the room. In the center of the room is an inactive lift. To the right of that is a station with circuit boards and capacitors. One circuit board is on the desk and another is in the machine powering the lift. The capacitors are inside the desk (lift the handle). Use one hand to hold the board and another to add the capacitors. Match the symbols on the back of the board to the capacitors. There's a tester on the desk if you need it but you can just put the boards into the machine as well to test. If you did it correctly the breaker switch box will open. Throw the switch to activate the lift. Ride the lift down and follow the path to the generator room. 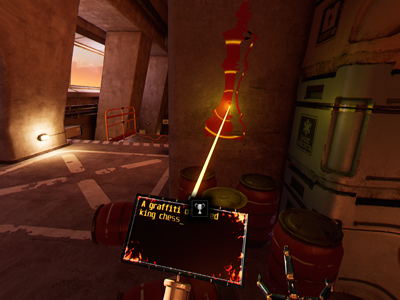 Use the jetpack to jump platform to platform until you get to one of the 4 stations you need to fix. For the water stations open one of the three valves, pump the right lever until it reaches the level marked in green, then shut the valve while the level is still in the green. If you have too much, open and close the valve quickly to just let a little water out. If you have too little, open the valve and pump more water in. Once all are green throw the breaker. For the pipe stations you need to let pressure in with the cranks and use the valve levers to block/allow different amounts of pressure. The dial on the console will show how much pressure is in the system. Once it's green throw the breaker. For the left side station (going from left to right) use levers 1,3, and 5 and turn both cranks. For the right side station use lever 3 and turn all the cranks. 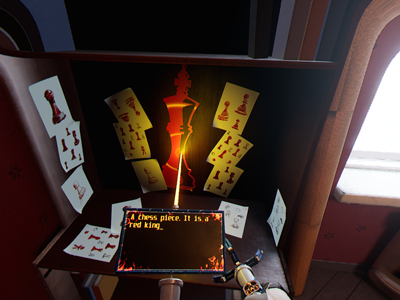 After the cutscene, return to the power room and put the white pawn onto the chess board to open a red portal. Follow this into the loyalty test room. Complete the loyalty test by following the instructions scanned from the screen and pressing whichever answers you want (not sure if the answers do anything but you can't fail it as far as I can tell). Once completed, a door to the security room will open. In the security room there is a bank of security monitors, a hacking station, and a password station with numbered buttons. By the security monitors is a slip of paper with a password on it; 1, 4, C, 6. Enter the password at the password station to patch into the system. Enter the vault and use the code hints on the desk to open the safe. The hints show a set of 3 numbers that follow a sequence going from one attempt to the next. Use your new security clearance to exit the room and head back to the elevator. Now you can use the elevator and head all the way down to the habitat area. When you enter this area you will have Nikolai and Olga's rooms on the right and Stas' room on the left. Also in Nikolai's room a panel with some symbols on it. These symbols match the ones on the large statue in the main habitat area. Take the model of that statue (it's on the desk by the panel) out to the main area and line it up to match the statue. Make note of which symbols correspond to the dots on the model. On the panel in Nikolai's room press the symbols that match the ones designated by the model. 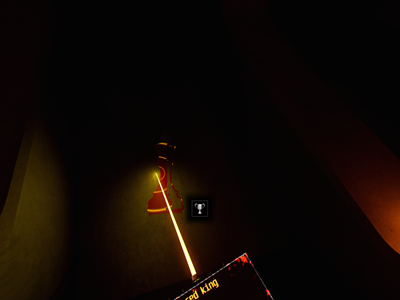 Once inside the secret room, head to the posters in the back. Open the spy hole in the center poster and use this to scan Olga's security card. Head back out to the main area and use this access to get into Olga's room. As you approach her locker it will shut and lock itself. Throughout the room are different awards/statues with a number on them. Take these numbers and order them according to the picture on the wall. The locker code is 318. 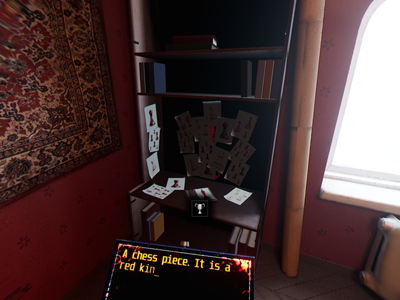 Take the pawn from the locker and place it on the chess board in Stas' room to open a red portal into Sasha's room. Now go to the right side of the room to the fuel cell station. You will need to charge up both cells in the center and place one into the receptacle on each side. If you move too quickly the cells will deplete. They will beep and flash if you are going too fast. Once you have them charged and loaded in turn the knobs and throw the breakers. This will activate the laser. Head up the stairs to the center laser and fire it directly in front of you into the large red orb. This will split the beam to either side of you and light up some colored symbols. On either side of the main laser you need to match the input/output symbols to the one shown on the screen. Your inputs are shown on the screens in front and the output on the screens to your side on the next station. When you complete these correctly the beam will continue on to the next station. Repeat this process at the next station, this time with the output matching the symbols in front of you and the input matching the ones on the wall below the upper laser in the center. Once these are correct the beam will continue in the teleporter and the lower laser will be activated. After the cutscene, turn around and place the pawn on the chessboard to make another red portal. Follow the portal back to the habitat room. Head for the elevator and it will take you up to the communications room. In this room is a star map, satellite controls and a couple drives. Now head to the 3 cranks that control the star map in the middle of the room. For the first one turn it until this base is inside the circle. Now use the other two cranks to create an unbroken line from the base to the Earth in the center. Most of the lines will not match up. You just want one of them. The correct one will go from the base to the left and then to the earth. Thanks, smashero for confirmation of the randomized parts.